The new Morini Rent commercial vehicle livery was conceived by the COM&C. No Frills Agency to respond to the need of the customer to witness, also visually, the transformation of a Turin-born family company, into a modern business operating throughout the country thanks to a fresh and innovative entrepreneurial culture, promoter of a cutting edge and winning organisational approach. The result is a livery with a modern and clean design, which gives greater significance and visibility to the brand, making the vehicles easy to identify. The graphic elements used, strongly recall the brand identity. 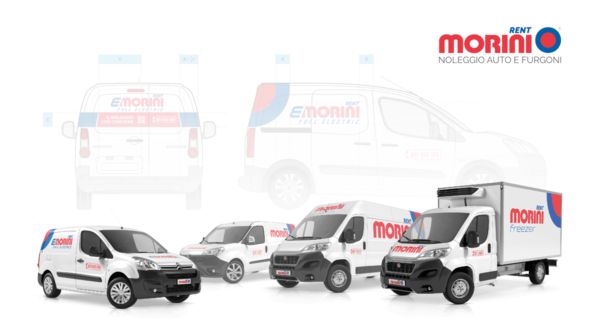 The new image of Morini Rent vehicles is a great step forwards towards a goal of full brand recognition, along a path that will lead customers to identifying Morini Rent as the best choice for short and medium-term rentals of commercial vehicles in Italy.